At Bowman Masonry & Waterproofing, it's our job to make sure that your musty crawlspace is transformed into a cleaner, drier, healthier, and more energy-efficient space. 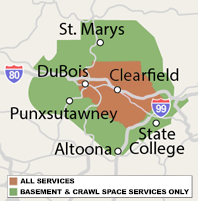 Our crawl space encapsulation services are available in Saint Marys, Bellefonte, Altoona, State College, Du Bois and nearby. For a free crawl space repair quote, call or e-mail us today! Our vapor barrier system is even more effective when combined with our crawl space insulation and drainage matting. For a free, no-obligation crawl space repair quote, contact us by phone or e-mail today! We work throughout Greater Clearfield, including Altoona, State College, Bellefonte, Du Bois, Saint Marys, Pennsylvania Furnace, Brockway, Port Matilda, Tyrone, Ridgway, Kersey and surrounding areas.